"The Enzymatic Transfer of Strained Ring Containing Bioorthogonal Tags" by Kristina Poss '14 and James Wollack Ph.D. The most common ways to conduct bioorthogonal reactions— reactions that can proceed independently despite being in the midst of other potentially reactive materials— involves copper catalysts and can be toxic for the biological system being studied. This project looks at new ways to conduct bioorthogonal reactions without toxic copper catalysts. It will specifically determine the concentrations of material that is necessary for such reactions to occur. This project is funded by a Small-scale 3M Collaborative Student-Faculty Research Grant. 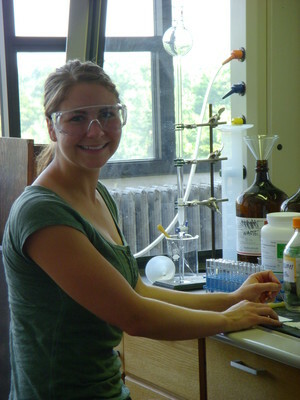 Soon after Kristina Poss ’14 completed her first semester of “Organic Chemistry” with James Wollack, assistant professor of chemistry, the two began working together on a grant-funded research project. The project, The Enzymatic Transfer of Strained Ring Containing Bioorthogonal Tags involves biochemistry and bioorganic, subjects Poss says she enjoys and had wanted to learn more about. For Poss, the research project not only provides beneficial training, but it also serves as her on-campus job. She says having flexible work hours has helped her balance her other commitments which include being a member of the St. Kate’s cross-country and track teams.